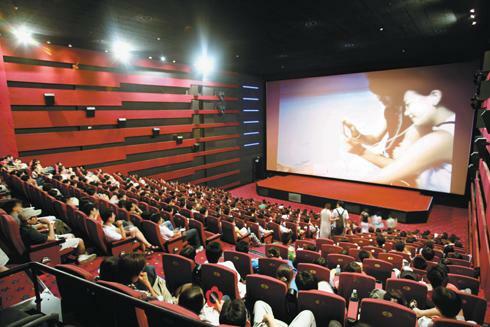 One of my favourite parts of going to the movie used to be the previews at the beginning. It was like getting to watch a bunch of free movies, almost harkening back to the days when your nickel got you a newsreel and a cartoon before the main feature. 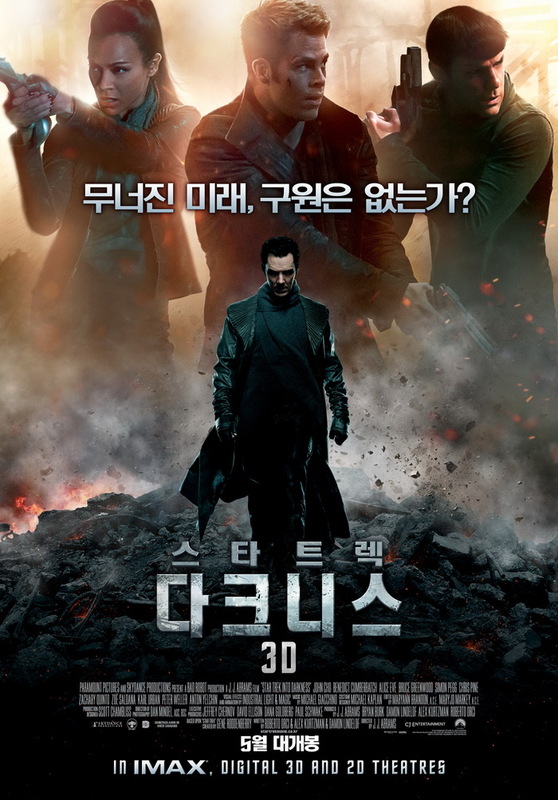 Honestly, I haven’t been to a movie in North America for a while (although I hear popcorn has to be purchased in gold now) but in Korea, the previews before a movies are a whole different thing. Specifically, they’re advertisements. And there are a ton of them. It’s interesting to see trends change over time. There are always cellphone commercials, since this is Korea, but there used to be an insane amount of alcohol commercials. This last weekend, when I went to see Star Trek: Into Darkness, there wasn’t a single one, which is good, I suppose. Here is a list of the commercials I did see before the movie though. 6. a trailer for the Korean movie 마이 라띠마 (Mai Ratima), which is about a love affair between a lower-class Korean man and a Thai mail-order bride. 10. Maxim coffee, specifically what I call “coffee sticks”. It’s a thin tube with instant coffee, sugar, and creamer in it and makes about 150ml of coffee. 12. Restylane, which apparently is a wrinkle remover. 14. a Megabox theater announcement about fire exits, illustrated by the animated character, Pucca. 15. Hyundai again, although this one might have been for Hyundai real estate. I can’t remember. 16. Home CC, which is the interior decorating branch of a paint and chemical company, KCC. They own the basketball team in the city where I live. 17. LG: specifically for pocket-sized photo printers that connect to your cellphone. 19. a trailer for a movie called 은밀하게 위대하게 (Eunmilhage, Widaehage: “Secretly, Greatly”), which is an action/comedy about a North Korean sleeper agent in Seoul. So, there you have it. 30 commercial in total, with only 3 movie trailers and only one of those an English movie. But then we got to see Star Trek, so it was worth it. This is the case at every single movie you go to here, although I guess after 8 years, I’ve gotten used to it. And honestly, it beats having to pay $20 for a bucket of popcorn. Here’s the movie I saw. If there is one food that is all over the world, it’s Chinese food. For most people, it’s not hard to believe that the food they eat at a Chinese buffet is not exactly what Chinese people eat every day at home, but what people don’t always realize is that Chinese food is not the same in every country. There were Chinese foods in Canada that I have never seen in the US and I have heard of differences in other countries as well. However, nowhere (in my experience) is Chinese food as different as in Korea. 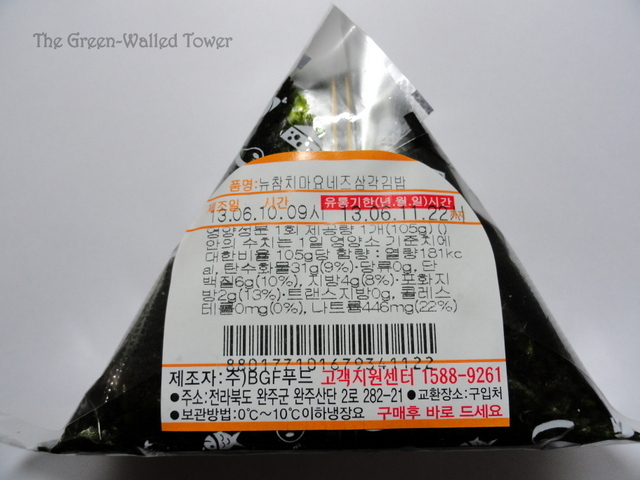 I have heard that what is considered Chinese food in Korea comes from the northeast of China, but it is quite unique (except for fried rice: everywhere has fried rice). 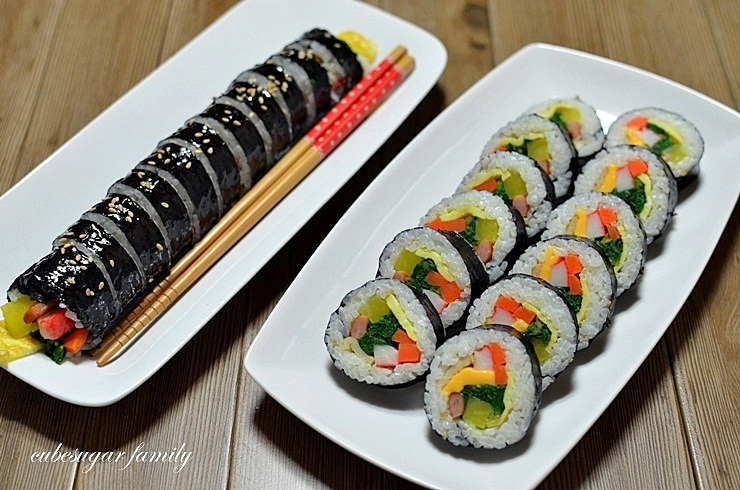 Here are the main dishes you see at Korean Chinese restaurants. 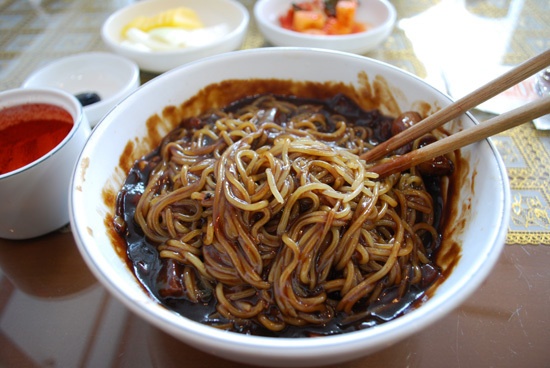 Jajangmyeon (자장면): Jajangmyeon is kind of the go-to Korean Chinese food. It is noodles in a black soybean-based gravy. 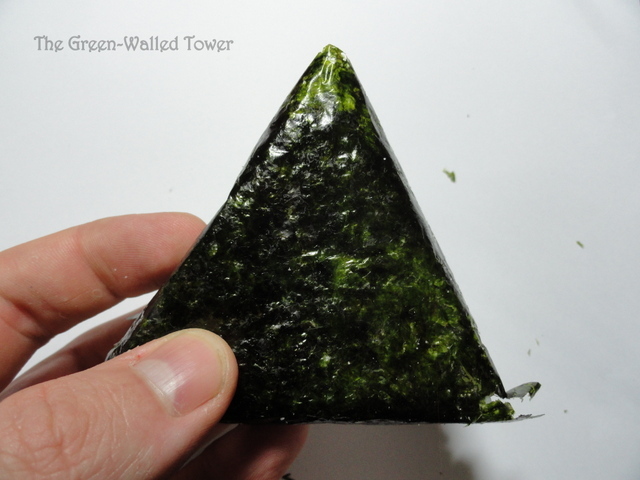 It doesn’t have a strong flavor, but it’s very good. There is also jajangbap, which is the same, but with rice instead of noodles. Jjambbong (짬뽕): This is the other main Chinese food here. Jjambbong means something like “hodge podge” so it’s a mixture of many things. As you can see by the color, it is very spicy. 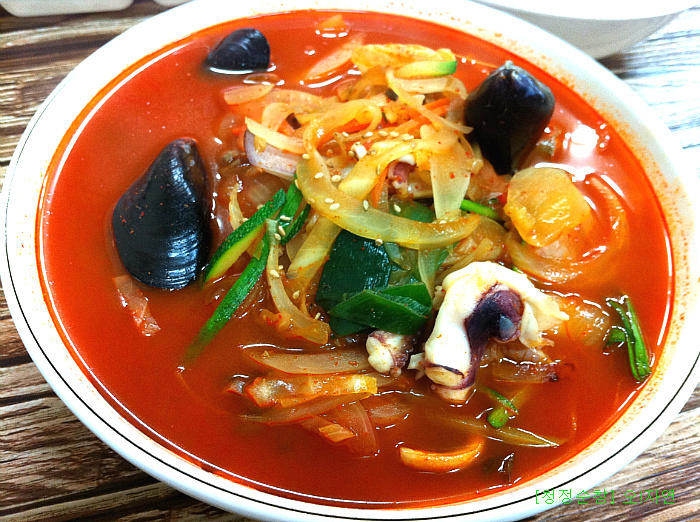 Jjambbong consists of noodles and various types of seafood such as squid, mussels, sea cucumber, and if you get the expensive stuff, a lot more. It also has a lot of onions in it. 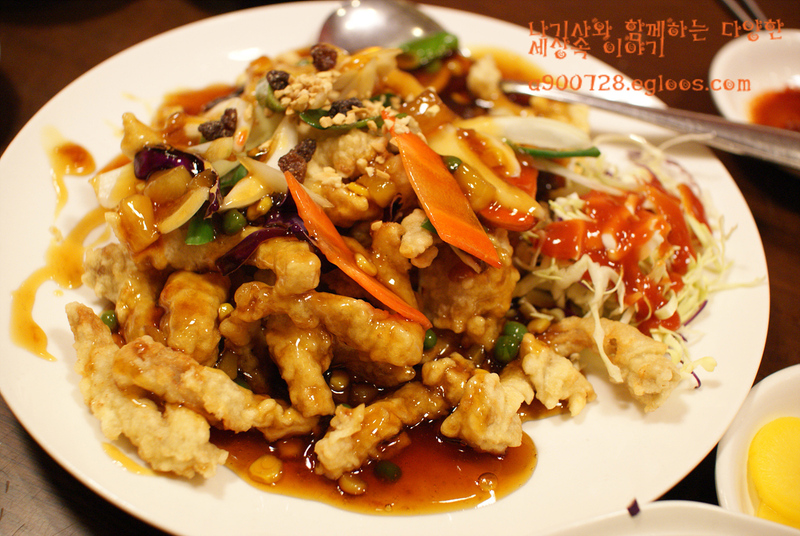 Tangsooyook (탕수육): This is fried pork (or beef, if you want the really expensive stuff) served with a sweet and sour sauce. In some ways it is similar to sweet and sour pork in North America, although (in my opinion) it’s a ton better and also is a lot more expensive. A small serving is about $15 and a large is $20 or more. Of course, a small serving is enough for 2-3 people. This is one of those dishes that only comes in group sizes. Koreans almost always eat out together and so a lot of their food is geared towards groups (I have been turned away from restaurants for being alone, since they had nothing on the menu for only one person). 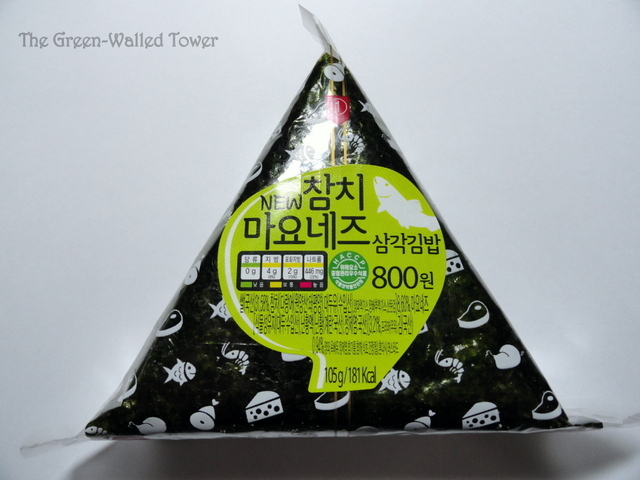 This is one of my favorite Korean Chinese foods. 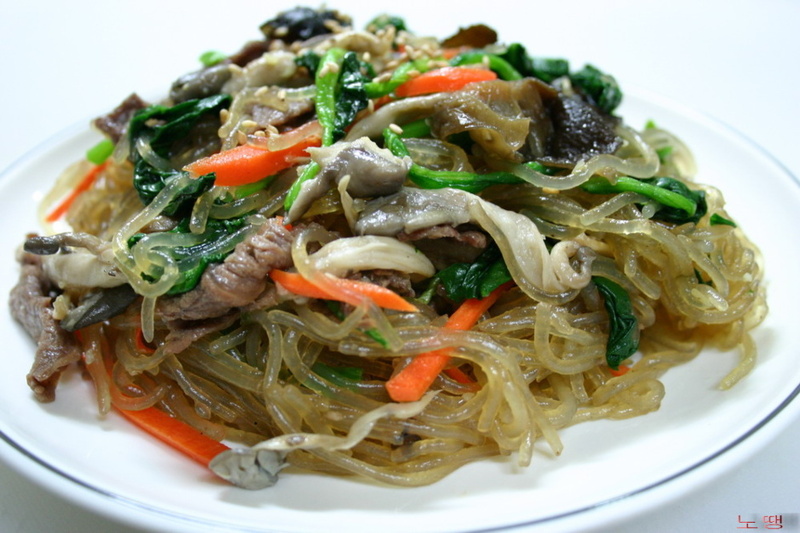 Japchae (잡채): This is the final mainstay of Korean Chinese food: japchae. This is perhaps a little more familiar looking. It is rice noodles mixed with meat and vegetables. It’s usually pretty mild, although some places make it really spicy. This is a meal that my wife and I ordered last November when we wanted to splurge. She got the fried rice and I got the jjambbong (lower right). The three-section dish in the lower center is a constant with Korean Chinese food: yellow pickled radishes (which are Korean, originally from Japan), black soybean paste, and raw onion pieces (not pictured, because my wife eats them immediately). 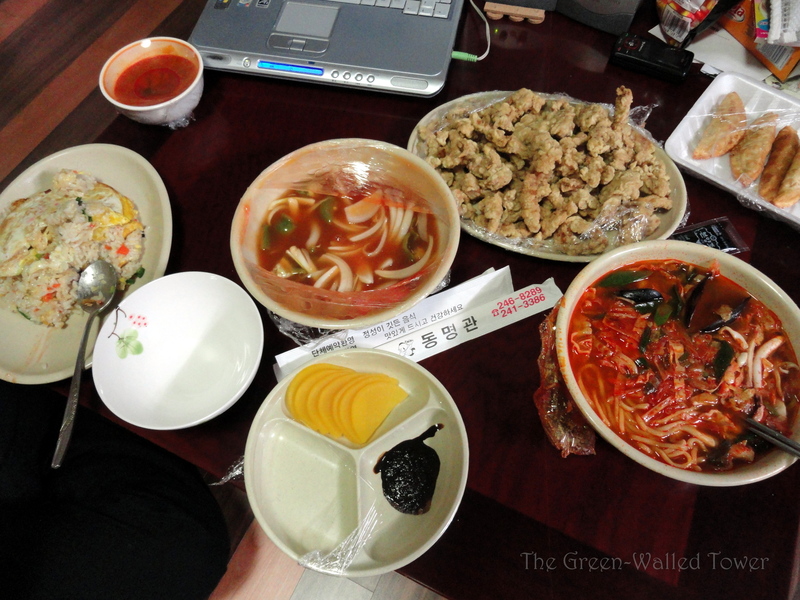 The tansooyook is in the middle, with a big bowl of its sauce. And as if that’s not enough food, they also threw in an order of mandoo, or dumplings, (upper right) for free. Because Korea is all about the free stuff. They give you wooden chopsticks, but real spoons and real dishes. You eat and when you’re finished, you put them outside your door and the delivery boy comes and gets them later. I’m very glad this system works here, since using real dishes is so much nicer than styrofoam or paper. 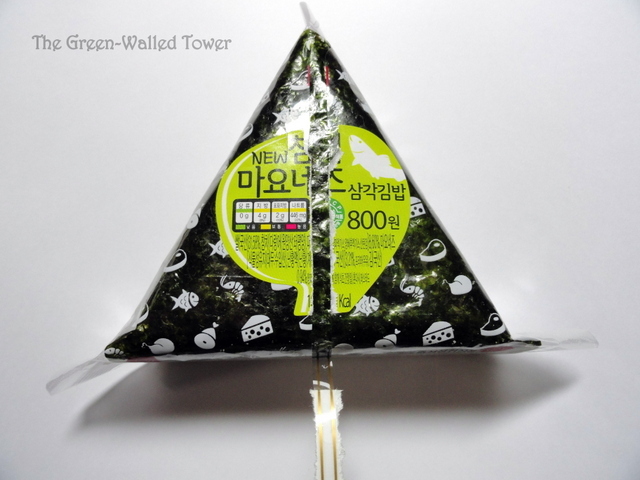 I have grown very fond of Korean Chinese food but the problem is, that once I leave Korea, it will be very hard to find. It’s not Korean food, so you can’t find it in most Korean restaurants outside of Korea. And it’s not normal Chinese food, so Chinese restaurants don’t have any of it. There are restaurants in Korean districts, such as in New York or LA that have it, so I’ll have to make a trip to a city every now and then to get it. 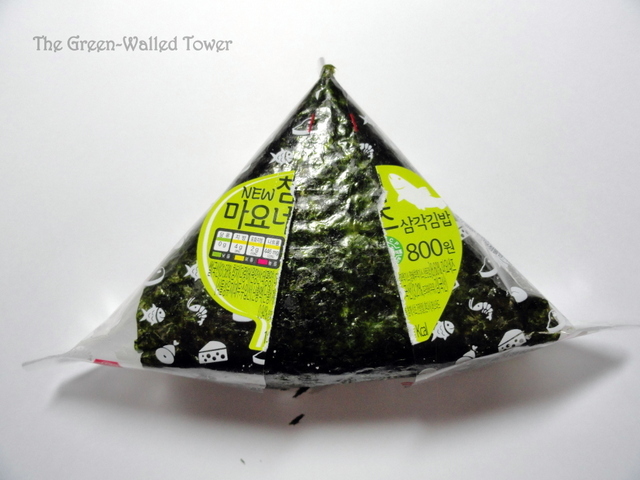 If you’re near a Korean district, I’d recommend seeking it out. Don’t you wish you had a get-out-of-jail card for small annoyances? If you’re a buxom blonde, maybe you do, but an easier way (at least if you look like me—neither buxom nor blonde) is to move to another country. In my case, Korea. 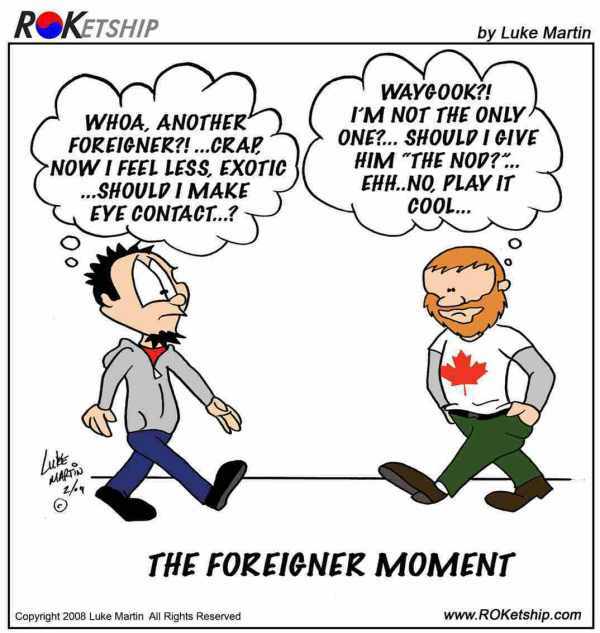 I’m not sure about other countries, but in Korea, we call it the foreigner card. 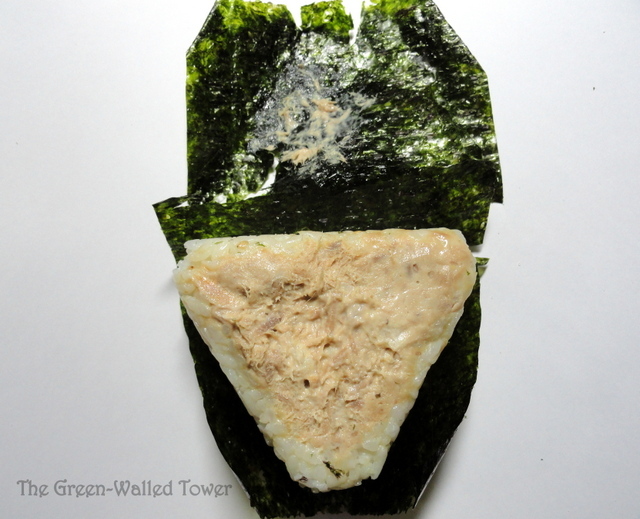 It is an acknowledgement that as foreigners (i.e. non-Koreans), that along with all the disadvantages of living in a foreign culture, we have certain privileges by not fitting into the cultural system. It’s one of perks of living over here. Let me give you some examples. You are driving and run a red light. A policeman pulls you over, but upon seeing you’re a foreigner (and assuming you don’t speak Korean) he lets you go because he doesn’t want to deal with the situation. You want to return something at a store without a receipt. They refuse, saying it’s not the policy. You give them a blank look and keep nudging it towards them, saying juseyo (please give me) and eventually they just do it to make you go away. All the teachers at the school are going out to eat. Although there is mandatory attendance, you don’t want to go, so when they tell you about it—in Korean—you give a big smile and say, in English, “see you tomorrow” and just go home. Now some of those are accidental and some are deliberate, but you get the idea. The idea is getting away with things that other can’t simply because we don’t fit in or people assume we don’t understand (or we pretend we can’t). Here’s why it works. We stand out. – I will never, ever pass for a Korean. I did have one man ask me if I was Korean, but he was either drunk or a bad guesser. I don’t stand out like a sore thumb; I stand out like a missing limb. If you happen to be black, then you stand out even more. Because of this, it is very easy for people to make judgments about us before we even speak. Here are some of the common stereotypes: foreigners don’t speak Korean; they don’t understand the culture; they’ve just arrived in Korea; and they insist on others speaking English. And so on. The point is that even before I open my mouth, the other person has formed an opinion of me in their head. A lot of the stereotypes are true. – I’m not trying to bash foreigners living in Korea: I am one, and even though I speak Korean now, I didn’t when I got here. The truth is that there is a huge demand for English teachers here and speaking Korean is not one of the requirements. People often come for a year and then leave, which means they don’t have the time or motivation to learn much of the language. Because of this, they are forced to interact with Koreans with what they have: English and gestures, which can be frustrating for everyone involved. 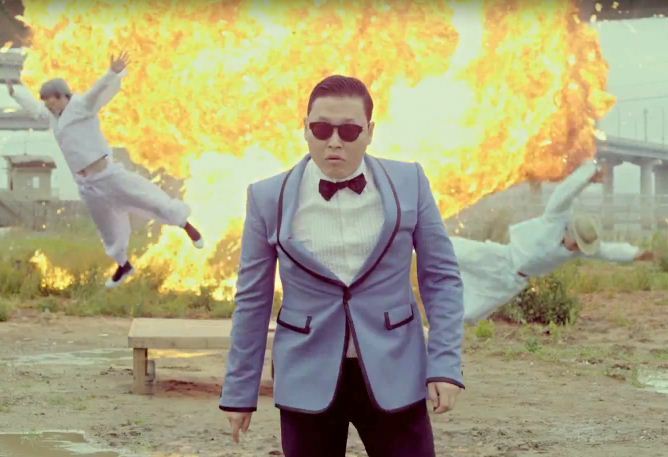 Some Koreans get so tired of going through this time after time that they just try to avoid it. Some shopkeepers type the price into a calculator and show it to me because they assume I wouldn’t understand them if they said it. Korean culture puts a high emphasis on service. – When you are a customer in Korea, then you are a king. Tipping isn’t practiced here and it’s very common for shopkeepers to throw in a bit extra or something free, just as good service. You run across people who don’t want to serve foreigners, but usually they will err on the side of good service. On one hand, it’s very nice that people make exceptions for us at times, since as I said before, a lot of it is deserved. It is very humbling to live here without knowing the language, since you have to rely on others to help with a lot of things: setting up an account, going to the doctor, buying a cell phone, etc. However, some people try to game the system by pretending they are more ignorant than they are. Since people already assume we’re ignorant, why not use that to our advantage, right? I try not to use the foreigner card if I can help it. Mostly because it’s dishonest if I deliberately pretending to be more ignorant than I am, but also because after living here for so long, I really want to fit in. I am very tired of always being the exception, even when it’s beneficial. Also, I want people to know I speak Korean, because dealing with foreigners is very stressful for a lot of people. Koreans feel that because they study English in school, they should speak English when they meet a foreigner, not that the foreigner should speak Korean. I can see the fear in their eyes when I come into their shop, as they desperately try to remember everything their middle school teacher said while they were talking in the back of the class. So, I try to speak Korean as soon as possible to put them at ease. You can see some of them, usually younger people who have studied English, visibly deflate with relief when they realize you can speak Korean. So, there it is: a way out of minor difficulties based on stereotypes, real and perceived language barriers, and cultural misunderstanding. Still, it’s nice to have it if you need it.